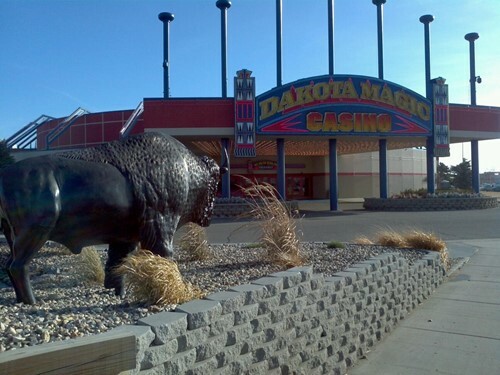 The The Buffet is a restaurant inside Dakota Magic Casino & Resort in Hankinson, North Dakota. Good customer service and various promotions. A lot of the employees go out of their way to make it a pleasurable experience for you. Machines are always nice and clean. Food is pretty good, could be better, and I haven't stayed in one of their rooms for a while so I don't know about that. Stayed two nights at the Dakota Magic hotel and it was nothing special to write home about. The rooms have no frills and are due for an update. You can request a smoke--free room, but the entire facility smells like an ashtray. There is no workout facility or pool and even though they advertise free WiFi, it is a terrible connection and there is no cell phone service. You aren't near anything so if you are looking for something else to do besides what is offered in property, be prepared to drive. We ate at the buffet one night and it was way overpriced for what was offered. The casino itself was nice and the dealers and pit bosses were very friendly. The hotel staff seemed put out if you asked them any questions. It had snowed prior to our stay and none of the sidewalks or parking lots had been cleared, which was a slippery mess. It was also extremely cold while we were there and one morning we had no hot water because the propane wasn't working. The hotel staff didn't seem too concerned about it and pretty much told us, we don't know what's wrong with it and it you'll get hot water at sooner or later. Probably won't be staying here again. Best casino in the area. I drive 4 hours each way at least twice a month. Table game selection and slot machines are great. The staff is always friendly and helpful. Hotel rooms are clean, comfortable, and affordable. Updated casino. Nice. Friendly staff. Good food. A great place for an evening out. It was under renovations. If you like to play slots on limited machines, this might be your place. Definitely overrated and left a lot to be desired. Would not go back. It was so very very cold here. I didn't win any money. All I got was two cookies and a candy bar, and they made me pay for those. The bathroom was decent, it at least didn't charge you to use it. The wind was miserable, I had to dig out my second coat, and I was still cold! It was warm inside though. Construction is going on but they are improving their customer service and various promotions. A lot of the employees go out of their way to make it a pleasurable experience for you. Machines are always nice and clean. Food is alright, could be better, and I haven't stayed in one of their rooms for a while so I don't know about that. I really enjoy coming up to this resort to perform. As an Entertainer it's nice when the staff takes care of you after hours and make sure you get settled in your room and helps you find some late night food. The load in for this banquet hall is super accessible and there's plenty of room to set up a large Stage Show. Plenty of good AC power is available which gives us lots of options during our setup. This is a two-story Ballroom with an upper deck so the Acoustics are great.